A future Earth torn asunder merged with realities which brought darkness, death and evil with them to curse the few survivors of mankind who survived what was truly an apocalypse. The world now is one of stark contrasts were there is desolation and death surrounding small city states and the remnants of the human race struggle in world driven back to the dark ages. Those survivors of "The Black" know their world was once different but none can remember exactly how and with vampires, ghouls and other sentient beasts there is no looking back only forward in an effort to survive one more day. The only saving grace is the birth of magic amongst the humans, warlocks and witches were born who along with spirits bound to their souls combat the arcane forces that are everywhere. In this world Eric Cross a Southern Claw warlock assigned to Viper squad embarks on a mission to track down a former Souther Claw leader who has betrayed her people and strives to deal with the Old One and in turn aid the vampire cause to end the war once and for all. Blood Skies is the first book in an ongoing series and is packed with visceral imagery and stark descriptions of a world which rivals the decay of once mighty industrial areas around our own world. This new Earth is truly depressing yet life and love goes on and there is always something and someone worth dying for and the human spirit fights on against the true vampire menace, nothing nice about these guys. It's hard to recognise a genuine hero in the story because all the characters are doing what is required to survive and self sacrifice is a common theme but it doesn't deny the truth that perhaps we can see some of the best of ourselves in those faced with such darkness with little hope. 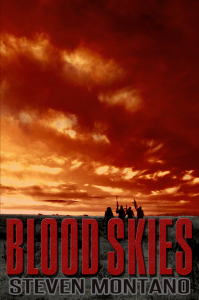 This review may sound a little negative in places but Blood Skies is a fascinating story with quite a few surprises and I've already bought the second book in the series "Black Scars" and that I think perfectly sums up my appreciation of the work.